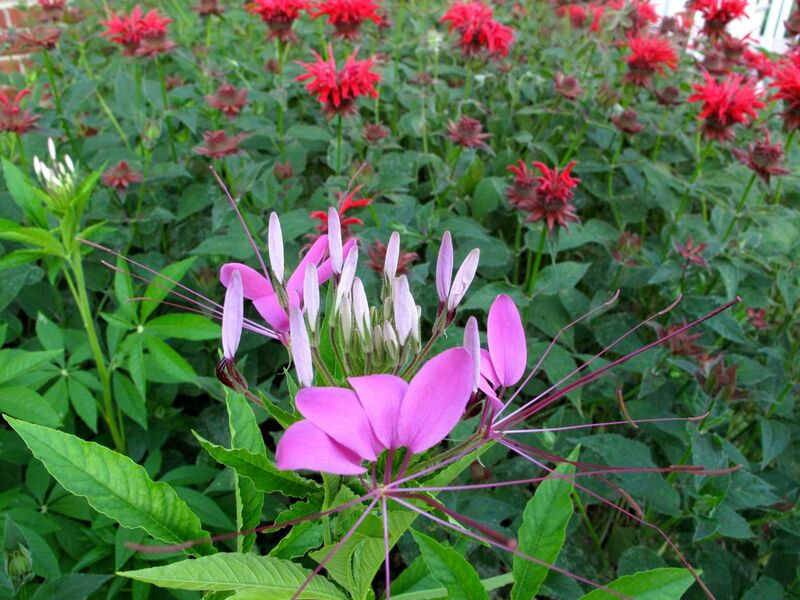 An easy to grow and deer-resistant annual, Cleome is just beginning to open this week. It has gone self-seeding crazy in my garden, but is easy to remove from unwanted places so I do not mind. This cleome came as seedlings shared by a friend many years ago. She had purchased the seeds at Monticello. Hummingbirds are attracted by the nectar of cleome and have already been frequenting this part of the garden recently to enjoy the nearby monarda. This entry was posted in garden and tagged Cleome hassleriana (Spider Flower), Monarda didyma on June 14, 2014 by pbmgarden. I can never decide if I really like this plant or not! I like yours and the way you’ve planted it and if humming birds were a European bird I would plant it just to attract them. Is it a good cut flower? I know what you mean Christina–some plants just don’t win us over. I’ve used cleome in informal arrangements but don’t remember them lasting particularly well; however, they are advertised as good cut flowers if you condition them well in warm water. I probably left out that step! They do have a thorny leaf but it’s never been a problem. Cleome are pretty interesting. Do you grow them Michael? Wow, that is a real eye catcher. 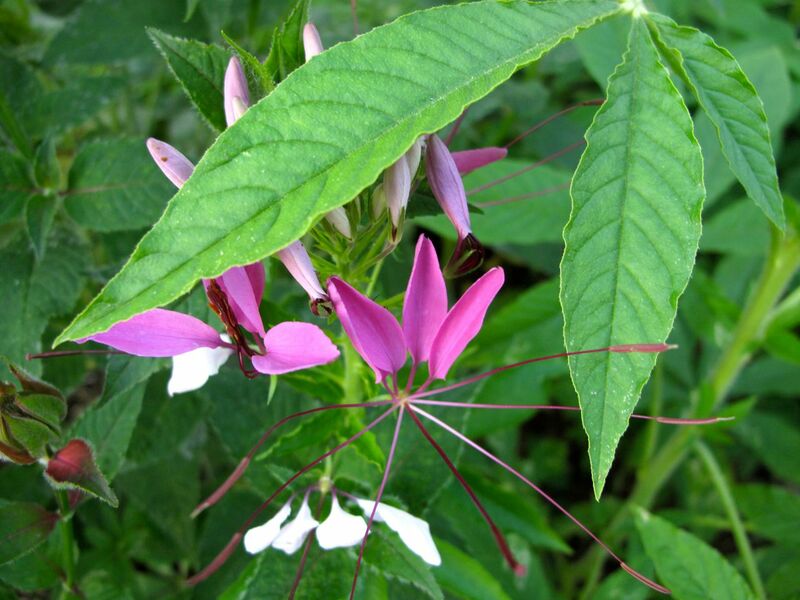 I have not seen cleome before, I am off to the internet to research this a little further. Glad I could introduce you to cleome Charlie. They’re easy to grow from seeds here in NC and I imagine they’d do well where you live. Lovely! I grew these once and they added so much structure to my garden, but haven’t managed to get them going since then as the snails love them! Beautiful photos! 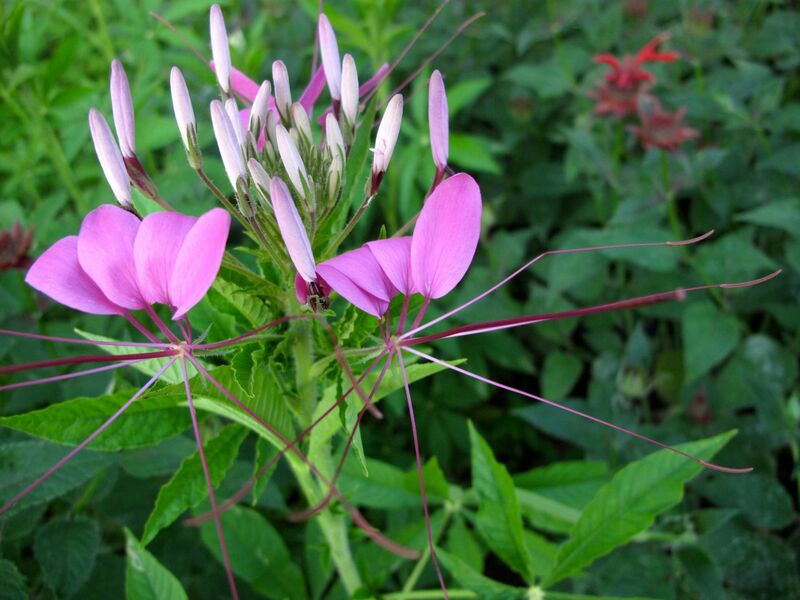 Yes, structure is a good word to use with Cleome. Sorry you have such a time with snails–they seem to love a lot of your little seedlings. I am trying to grow Cleome for the first time this year and I have a few small plants in the Cutting Garden. I had no idea they are deer resistant – if I like them I might try planting some in my ‘wildlife’ garden at the front of the house! Julie, “deer resistant” is something to take with a grain of salt because the deer will eat anything if they’re hungry enough or just curious. They have never bothered the cleome in my garden but they sure have tasted plenty else. Hope you’ll enjoy your cleome this year. I like this plant, especially the white ‘Sparkler’ variety. The newer ‘senorita rosalita’ less so. Wish it came in more colors. I’ve seen white cleome (not sure if it was ‘Sparkler’) and they are very attractive. White plants are useful in the garden, I think. How can you prevent your Beebalm from getting powdery mildew on the leaves? Mine start the season looking really nice but once the rain hits a couple of times they will get white patches on the leaves which start to fall off then. Sorry, but I don’t have a solution for that mildew. Mine are packed together way to close and have always assumed the plants needed more air circulation, but I never get around to thinning them out to test that theory. They do look pretty bad after a while. My bee balm is delayed too…yours is a gorgeous backdrop for the cleome….I had hoped to grow cleome this summer but the seeds will wait until next year.